An interview by « Be Curious TV » with Nabil Antaki a Syrian physician, and a Christian, who appeals to the West to open its eyes to the misinformation it is being fed. 16/06/2016 BeCuriousTV: « Welcome, Dr. Nabil Antaki. Please share with us what is happening in Aleppo and in Syria. You have been to Europe for a short while. You are Syrian, born in Syria and residing in Aleppo. You work as a doctor at the St Louis Hospital, in West Aleppo, meaning the area under the control of the regime. The people in the West do not realize what goes on in Syria after dusk. They could well ask which is worse, the violence perpetrated by the Syrian regime or that of the terrorists or “rebels”. This antagonism is reflected in the heart of our media, where on the one hand there are those who say that Bashar al Assad’s regime is terrifying his people, and on the other side those who maintain that Assad’s forces are defending their people against the “armed jihadis”. NA: That’s exactly it. The Western media only report the events in East Aleppo. Since 2012 Aleppo has been cut into two. Three hundred thousand people live in the areas under the control of the terrorists to the East, while the remaining three quarters of the population, about 1.5 million people, live in the Western areas, which are under the control of the Syrian government. So when we listen to what the Western media say is happening in Aleppo, they are focusing only on the Eastern area. When we cry out for help for Aleppo, it gets transformed into a cry for East Aleppo alone. When the media announced that the last pediatrician of Aleppo had been killed, it’s not true, because in West Aleppo there are about 100 pediatricians. Perhaps that was the last pediatrician in the other area, I have no idea, I have no information, but what I do know is that the inhabitants of the Eastern section live under the control of the terrorists. BCT: Have they let them escape from the area? NA: « From the very start over a million and a half people ran to West Aleppo out of fear of the terrorists, but there are also some people who were afraid to leave, perhaps not having the means to leave, or afraid of losing what they had accumulated in the course of their lives, their little apartment, their TV. They thought that if they left they were liable to lose all they had, so they decided to remain, not out of ideological reasons but for practical purposes they preferred to stay put. BCT: You have just told me about East Aleppo, which is under the control of the terrorists. Please explain to us the difference between the terrorists and the « rebels ». BCT: «And what about the refugees? 12 million people in search of shelter. NA: Half of the population of Syria has moved. There are 23 million people in Syria and 12 million have been thrown out of their homes, 3.5 million have sought refuge in neighboring countries such as Turkey, Lebanon and Jordan. 8 million are internally displaced people who have not left Syria but have been forced to leave their homes. This situation is very serious and these people need assistance just as much as those who have left the country. U.N. agencies focus only on the people who live in refugee camps outside of Syria. All these people are not running away from the acts of the Assad « regime » or of the Assad army, as depicted by the media. These people are not running from Assad’s government, nor from the Syrian army, nor from the hypothetical actions of one of these groups. These people are either running away from the battle zones or from penury. Most of the Syrian people now live below the poverty threshhold. 80% of the population of Aleppo depend on the food packages provided by NGO’s. These people are poor. They have run out of their savings. Those who have lost their jobs, those who had assets such as a workshop or a factory, a store, have lost everything. These people are penniless, they are fleeing this misery and the battle zones. They are also worried about the future of their children; they have put up with the war for 2, 3, even 4 years, but the war has been going on for 5 years and they want to ensure their children’s future by taking the decision to pick up and seek a future somewhere else, to begin a new life. BCT: How have the Syrians weathered the economic sanctions and embargoes imposed on them by the West since the beginning of the war? NA: They are disgusted with these sanctions because these sanctions and embargoes are not against the government of Syria but against the Syrian people, all of the Syrian people. For example, I personally, as someone who lives in Syria, have lost the right to do even the tiniest of operations. If I want to send 1000 dollars to my children, I am unable to. I can neither import nor export anything. This means paralysis. I am a doctor, I wanted to replace a part of a piece of some medical instruments. Normally this would have taken a week. In this case it took a year and a half to get the piece because we had to import it from Japan. So you see, it is the Syrian people who are hurt by these sanctions and at a certain point the EU did revoke them but only for the people who live in the areas under the control of the terrorists! The people who live in the areas under the control of the Syrian government weren’t allowed to do a thing. Contrary to their intentions, these sanctions do not penalize the « regime », they punish the people of Syria. BCT: « You are a Christian. A Christian of the Middle East. If one were to shed doubt on how balanced your point of view might be, what would be your reaction? NA: I am not talking to you as Nabil Antaki the Christian, I am talking as Nabil Antaki the Syrian who has witnessed his country being attacked and destroyed. It’s not a matter of being Christian or Muslim, Syria is an ethnic and religious mosaic. There are eleven different Christian churches and as many different Muslim faiths, and it’s not because the Syrian government protects the minorities that we support it. No, the government is secular, it protects everyone, whether minority or majority, all are respected within Syria. It’s a secular « regime ». Differently from the Islamic state which absolutely does not respect the minorities. If the Christians are pro -government or pro Syrian state it is because from the very beginning they came out for the secular state, in opposition to an Islamic state. The current President is very popular. I myself am not actually one of his fans, I defend Syria not the President. But his popularity is objectively undeniable and in my opinion if we had free elections tomorrow, based on international law, affording the right to vote to all Syrians, including those displaced abroad, we would see this President of ours re-elected. The West has never understood this. Assad was popular at the beginning of the war against Syria, and support for him today is even stronger, not because he defends minorities, which is what the media would have people believe, but because he defends all Syrians. 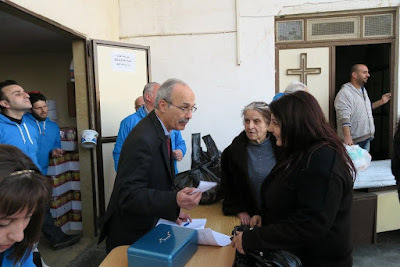 Christians make up about ’8% of the Syrian population, so when you say that Assad is popular because he defends the Christians and that this is why the Christians support Assad, it’s a joke. Whether we are for or against him has no effect on his popularity. We have neither armed groups nor arms, and we are just 8% of the population. Assad is popular with all the groups and sectors of our society, therefore if we want this war to end we have to stop demanding as one of the conditions that Assad leave. We have to negotiate with him, conduct free elections and work for democracy. BCT: Allow me to take up a few issues that you have mentioned. You speak of Assad’s enormous popularity. But was it enormous in 2011 too? NA: That is the issue! When the problems began, there were demonstrations against Bashar that numbered ten to fifteen thousand participants at most. These demonstrations were broadcast on televisions and the numbers were enormously exaggerated, up to one or two hundred thousand. On the other hand, massive spontaneous demonstrations were generated in the streets in support of the Assad government, in Aleppo, in Damascus, in all of the big cities. Over a million people who supported Bashar. No one filmed these demonstrations, or perhaps I should say no one broadcast them in the West. Hence, the organic demonstrations of millions of people have been ignored, while the few thousands who protested in the streets against Bashar were inflated beyond all recognition and highly exaggerated. From the outset there was an enormous amount of prejudice and partiality on the part of the media. Assad has always been very popular and this hasn’t changed. He may be even more popular than in the last years before the war. … Life wasn’t perfect but no one wanted the war, they wanted reforms. Even the most explicit enemies of the government did not want war and most certainly not this war. They wanted reforms and they wanted democracy, but no one wanted to kill Syria in order to improve Syria. NA: In my opinion the international coalition is ineffective because it is impossible to be on the same side. There is a coalition of the United States and Europe with Turkey and the Gulf States and at the same time we know that Turkey, Qatar and Saudi Arabia are financing the jihadis, Daesh, Al Nusra. On the one hand they want to fight against the terrorists, on the other hand they are helping them. This is a complete aberration. Besides, the Kurds in Syria have also taken up arms against DAESH. The United States has found an ally in the Kurds in the fight against DAESH. However Turkey is completely against arming the Kurds and therefore fights against them. So we have two countries who are allies, the United States and Turkey, but one of them is allied to the Kurds and the other is against them, this can never work. There are too many contradictions within the Western coalition and this is why it hasn’t achieved a thing. Before the Russian intervention, the air strikes of the coalition were mere cosmetics… They began to be effective only after Russia stepped in. From our point of view, the Russian intervention has been extremely advantageous and it has the full support of the Syrian people, which contradicts the Western narration. The West accuses Russia of striking not only the terrorist groups but also the “moderate rebels”. Russia has been very successful at bombing the groups of the Islamic state, so now the West is trying to slow them down, maintaining that they are not targeting the terrorist groups and accusing Russia of helping Bashar instead of attacking DAESH. Of course this is untrue, when the West does the bombing everything is ok but when Russia wants to bomb, it doesn’t do it well enough. BCT: How do you think the Western media are depicting the facts on the ground in Syria? NA: The Western media are not impartial. They are biased, they are against the Syrian state. They support the terrorist-rebels. We do not request that they be for or against the « regime », we simply ask that they look at things objectively. NA: « All I want to say to the West is to be more objective. Educate yourselves, don’t accept disinformation, put pressure on your governments because Syria is a country that wants its freedom, its prosperity and its democracy. The war has destroyed us, we have had enough, we want it to stop!